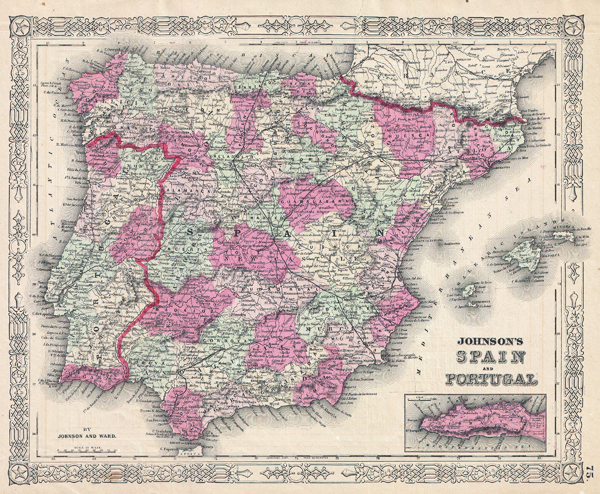 This is Johnson and Ward's 1864 map of Spain and Portugal. Covers the region with particular attention to transportation, cities, and waterways. Lower right hand quadrant has an inset map of Gibraltar. Includes the Balearic Island of Ibiza, Majorca and Minorca. Features the Celtic style border common to Johnson's atlas work from 1863 to 1869. Steel plate engraving prepared by A. J. Johnson for publication as plate no. 75 in the 1864 edition of his New Illustrated Atlas… This is the last edition of the Johnson's Atlas to bear the Johnson and Ward imprint. Very good condition. Minro verso repair to top margin. Text on verso. Rumsey 2905.043 (1860 edition). Phillips, Philip Lee, A List of Geographical Atlases in the Library of Congress, 6140.